After a long winter on the farm, spring is undoubtedly one of our favorite times of the year. During the cool winter months our trees are in a dormant slumber and sometimes appear without life because of their barren branches with no leaves or flowers. But due to the arrival of spring we are greeted each year with an abundance of flowers and spring green leaves…a true sign that the our cold temperatures are behind us. Hydrangeas are a beautiful plant to celebrate the warm season soon to be upon us. 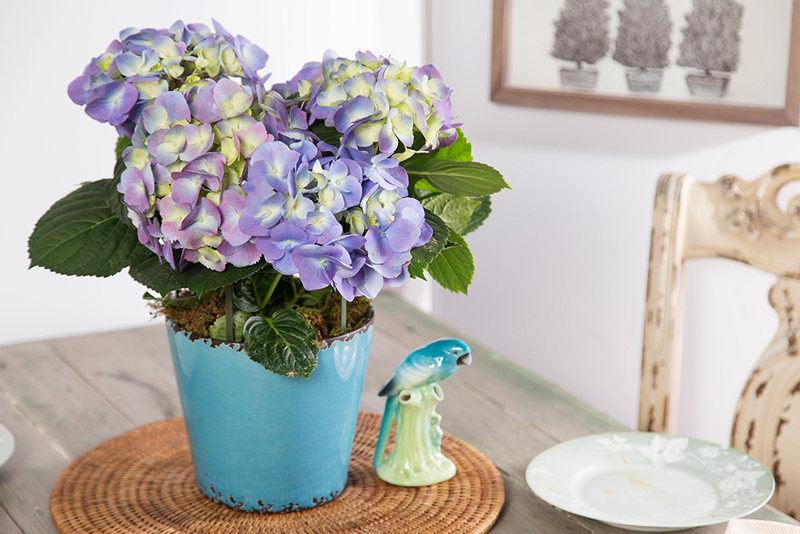 Available in shades of white, blue, purple and pink set against its bold dark green foliage, hydrangea is a popular blooming plant known for its clouds of tiny blooms. A wonderful addition to any garden, it adds a certain grace and texture that you won’t find anywhere else. This blooming plant also acts as a stunning cut flower bringing outdoor beauty into your home. When selecting a location in your garden to plant hydrangea do take into consideration the amount of space the plant will grow into over the years, as well as, how much sun it will need throughout the spring and summer months to truly flourish. The location where you plant hydrangeas in northern climates is wildly important for bloom production. The farther north you are – Zones 4-5a – the more sun your hydrangeas can handle. The best place to plant a hydrangea is in a location that allows for full morning sun with some shade in the afternoon. The further south you live, the less tolerant the plant is to the intense sun. Find a spot that allows for only 2-3 hours of morning sun with afternoon shade. Hydrangea plants do best when planted in a loamy soil. Dig your planting hole slightly larger than the pot size, and add a good nutrient soil in the hole before putting the hydrangea in place. If the roots are tightly packed, loosen them gently to encourage root growth. Make sure that the top of the root ball is level with the surrounding soil. Refill the hole with soil and pack it firmly around the crown. Add a slow release fertilizer 12 inches away from the stems of the plant. Hydrangeas tend to do especially well when fertilizers are used in spring or early summer. I recommend using a granular, slow-release fertilizer with a high percentage of phosphorus, as phosphorus is the element that encourages bloom production. Water regularly and thoroughly to prevent plant stress until the root system gets established. Hydrangeas tend to prefer well-drained, moist soil. Be aware that hydrangea bloom color is determined by the pH level of your soil. You can do a simple soil test at your local nursery. Soil with a pH below 6.0 (acidic soil) will produce blue hydrangea blooms, whereas, soil with a pH above 6.0 will produce pink hydrangea flowers. No matter what your pH level is though you can change it to suit your needs or color style. To encourage blue blooms in alkaline soils, add aluminum sulfate, composted oak leaves, pine needles or coffee grounds. To encourage pink blooms in acidic soil, add wood ashes, lime or fertilizers with high levels of phosphorus. Take note that if you live in an area where you have freezing temperatures in the Winter months, it is best to protect your hydrangea plants by insulating them at the base with mulch or leaves in late Fall. 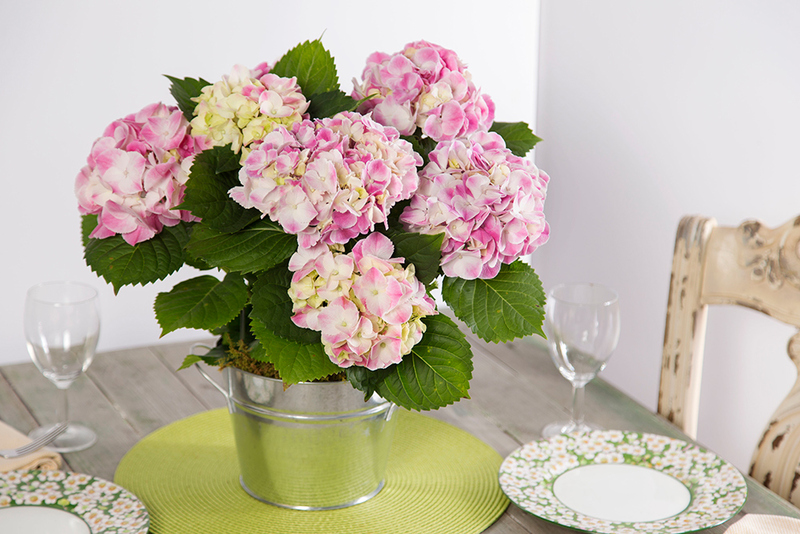 Midsummer you may want to enjoy your hydrangea blooms indoors. It is best to cut the stems in the morning while the weather is cool. Be sure to cut the stems at an angle and keep the blooms well hydrated in cool water. 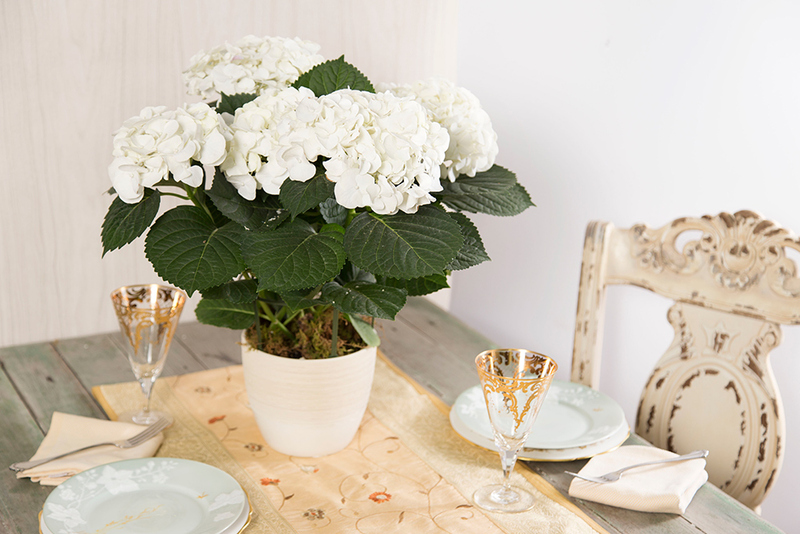 Hydrangea flowers make a stunning bouquet all on their own, but also create a wow factor when used in a mixed bouquet.